Some things I extracted while reading (the entire document is here). America has lots of commentary. conviction that the divine and the human meet in the slightest detail in the seamless garment of God’s creation, in the last speck of dust of our planet”. Climate change is a global problem with grave implications: environmental, social, economic, political and for the distribution of goods. It represents one of the principal challenges facing humanity in our day. Its worst impact will probably be felt by developing countries in coming decades. Many of the poor live in areas particularly affected by phenomena related to warming, and their means of subsistence are largely dependent on natural reserves and ecosystemic services such as agriculture, fishing and forestry. They have no other financial activities or resources which can enable them to adapt to climate change or to face natural disasters, and their access to social services and protection is very limited. For example, changes in climate, to which animals and plants cannot adapt, lead them to migrate; this in turn affects the livelihood of the poor, who are then forced to leave their homes, with great uncertainty for their future and that of their children. There has been a tragic rise in the number of migrants seeking to flee from the growing poverty caused by environmental degradation. glory to God by their very existence, nor convey their message to us. We have no such right. True wisdom, as the fruit of self-examination, dialogue and generous encounter between persons, is not acquired by a mere accumulation of data which eventually leads to overload and confusion, a sort of mental pollution. Real relationships with others, with all the challenges they entail, now tend to be replaced by a type of internet communication which enables us to choose or eliminate relationships at whim, thus giving rise to a new type of contrived emotion which has more to do with devices and displays than with other people and with nature. Today’s media do enable us to communicate and to share our knowledge and affections. Yet at times they also shield us from direct contact with the pain, the fears and the joys of others and the complexity of their personal experiences. Given the complexity of the ecological crisis and its multiple causes, we need to realize that the solutions will not emerge from just one way of interpreting and transforming reality. Respect must also be shown for the various cultural riches of different peoples, their art and poetry, their interior life and spirituality. If we are truly concerned to develop an ecology capable of remedying the damage we have done, no branch of the sciences and no form of wisdom can be left out, and that includes religion and the language particular to it. The creation accounts in the book of Genesis contain, in their own symbolic and narrative language, profound teachings about human existence and its historical reality. They suggest that human life is grounded in three fundamental and closely intertwined relationships: with God, with our neighbour and with the earth itself. According to the Bible, these three vital relationships have been broken, both outwardly and within us. This rupture is sin. The harmony between the Creator, humanity and creation as a whole was disrupted by our presuming to take the place of God and refusing to acknowledge our creaturely limitations. This in turn distorted our mandate to “have dominion” over the earth (cf. Gen 1:28), to “till it and keep it” (Gen 2:15). As a result, the originally harmonious relationship between human beings and nature became conflictual (cf. Gen 3:17-19). In the Judaeo-Christian tradition, the word “creation” has a broader meaning than “nature”, for it has to do with God’s loving plan in which every creature has its own value and significance. Nature is usually seen as a system which can be studied, understood and controlled, whereas creation can only be understood as a gift from the outstretched hand of the Father of all, and as a reality illuminated by the love which calls us together into universal communion. The universe did not emerge as the result of arbitrary omnipotence, a show of force or a desire for self-assertion. Creation is of the order of love. God’s love is the fundamental moving force in all created things: “For you love all things that exist, and detest none of the things that you have made; for you would not have made anything if you had hated it” (Wis 11:24). Every creature is thus the object of the Father’s tenderness, who gives it its place in the world. Even the fleeting life of the least of beings is the object of his love, and in its few seconds of existence, God enfolds it with his affection. From the beginning of the world, but particularly through the incarnation, the mystery of Christ is at work in a hidden manner in the natural world as a whole, without thereby impinging on its autonomy. Our freedom fades when it is handed over to the blind forces of the unconscious, of immediate needs, of self interest, and of violence. In this sense, we stand naked and exposed in the face of our ever-increasing power, lacking the wherewithal to control it. We have certain superficial mechanisms, but we cannot claim to have a sound ethics, a culture and spirituality genuinely capable of setting limits and teaching clear-minded self-restraint. But one cannot prescind from humanity. There can be no renewal of our relationship with nature without a renewal of humanity itself. There can be no ecology without an adequate anthropology. Christian thought sees human beings as possessing a particular dignity above other creatures; it thus inculcates esteem for each person and respect for others. Our openness to others, each of whom is a “thou” capable of knowing, loving and entering into dialogue, remains the source of our nobility as human persons. A correct relationship with the created world demands that we not weaken this social dimension of openness to others, much less the transcendent dimension of our openness to the “Thou” of God. Our relationship with the environment can never be isolated from our relationship with others and with God. Otherwise, it would be nothing more than romantic individualism dressed up in ecological garb, locking us into a stifling immanence. When human beings place themselves at the centre, they give absolute priority to immediate convenience and all else becomes relative. Hence we should not be surprised to find, in conjunction with the omnipresent technocratic paradigm and the cult of unlimited human power, the rise of a relativism which sees everything as irrelevant unless it serves one’s own immediate interests. There is a logic in all this whereby different attitudes can feed on one another, leading to environmental degradation and social decay. We were created with a vocation to work. The goal should not be that technological progress increasingly replace human work, for this would be detrimental to humanity. Work is a necessity, part of the meaning of life on this earth, a path to growth, human development and personal fulfilment. Helping the poor financially must always be a provisional solution in the face of pressing needs. The broader objective should always be to allow them a dignified life through work. Yet the orientation of the economy has favoured a kind of technological progress in which the costs of production are reduced by laying off workers and replacing them with machines. A politics concerned with immediate results, supported by consumerist sectors of the population, is driven to produce short-term growth. In response to electoral interests, governments are reluctant to upset the public with measures which could affect the level of consumption or create risks for foreign investment. The myopia of power politics delays the inclusion of a farsighted environmental agenda within the overall agenda of governments. Thus we forget that “time is greater than space”, that we are always more effective when we generate processes rather than holding on to positions of power. True statecraft is manifest when, in difficult times, we uphold high principles and think of the long-term common good. Political powers do not find it easy to assume this duty in the work of nation-building. Once more, we need to reject a magical conception of the market, which would suggest that problems can be solved simply by an increase in the profits of companies or individuals. Is it realistic to hope that those who are obsessed with maximizing profits will stop to reflect on the environmental damage which they will leave behind for future generations? Where profits alone count, there can be no thinking about the rhythms of nature, its phases of decay and regeneration, or the complexity of ecosystems which may be gravely upset by human intervention. Moreover, biodiversity is considered at most a deposit of economic resources available for exploitation, with no serious thought for the real value of things, their significance for persons and cultures, or the concerns and needs of the poor. Compulsive consumerism is one example of how the techno economic paradigm affects individuals. … This paradigm leads people to believe that they are free as long as they have the supposed freedom to consume. But those really free are the minority who wield economic and financial power. Amid this confusion, postmodern humanity has not yet achieved a new self-awareness capable of offering guidance and direction, and this lack of identity is a source of anxiety. We have too many means and only a few insubstantial ends. When people become self-centred and self enclosed, their greed increases. The emptier a person’s heart is, the more he or she needs things to buy, own and consume. It becomes almost impossible to accept the limits imposed by reality. In this horizon, a genuine sense of the common good also disappears. As these attitudes become more widespread, social norms are respected only to the extent that they do not clash with personal needs. We are always capable of going out of ourselves towards the other. Unless we do this, other creatures will not be recognized for their true worth; we are unconcerned about caring for things for the sake of others; we fail to set limits on ourselves in order to avoid the suffering of others or the deterioration of our surroundings. Disinterested concern for others, and the rejection of every form of self-centeredness and self-absorption, are essential if we truly wish to care for our brothers and sisters and for the natural environment. These attitudes also attune us to the moral imperative of assessing the impact of our every action and personal decision on the world around us. If we can overcome individualism, we will truly be able to develop a different lifestyle and bring about significant changes in society. Only by cultivating sound virtues will people be able to make a selfless ecological commitment. A person who could afford to spend and consume more but regularly uses less eating and wears warmer clothes, shows the kind of convictions and attitudes which help to protect the environment. There is a nobility in the duty to care for creation through little daily actions, and it is wonderful how education can bring about real changes in lifestyle. We must not think that these efforts are not going to change the world. They benefit society, often unbeknown to us, for they call forth a goodness which, albeit unseen, inevitably tends to spread. Furthermore, such actions can restore our sense of self-esteem; they can enable us to live more fully and to feel that life on earth is worthwhile. the ecological crisis is also a summons to profound interior conversion. It must be said that some committed and prayerful Christians, with the excuse of realism and pragmatism, tend to ridicule expressions of concern for the environment. Others are passive; they choose not to change their habits and thus become inconsistent. So what they all need is an “ecological conversion”, whereby the effects of their encounter with Jesus Christ become evident in their relationship with the world around them. Living our vocation to be protectors of God’s handiwork is essential to a life of virtue; it is not an optional or a secondary aspect of our Christian experience. This conversion calls for a number of attitudes which together foster a spirit of generous care, full of tenderness. First, it entails gratitude and gratuitousness, a recognition that the world is God’s loving gift, and that we are called quietly to imitate his generosity in self-sacrifice and good works … It also entails a loving awareness that we are not disconnected from the rest of creatures, but joined in a splendid universal communion. As believers, we do not look at the world from without but from within, conscious of the bonds with which the Father has linked us to all beings. An adequate understanding of spirituality consists in filling out what we mean by peace, which is much more than the absence of war. Inner peace is closely related to care for ecology and for the common good because, lived out authentically, it is reflected in a balanced lifestyle together with a capacity for wonder which takes us to a deeper understanding of life. Nature is filled with words of love, but how can we listen to them amid constant noise, interminable and nerve-wracking distractions, or the cult of appearances? We are speaking of an attitude of the heart, one which approaches life with serene attentiveness, which is capable of being fully present to someone without thinking of what comes next, which accepts each moment as a gift from God to be lived to the full. Love, overflowing with small gestures of mutual care, is also civic and political, and it makes itself felt in every action that seeks to build a better world. Love for society and commitment to the common good are outstanding expressions of a charity which affects not only relationships between individuals but also “macro-relationships, social, economic and political ones” … social love moves us to devise larger strategies to halt environmental degradation and to encourage a “culture of care” which permeates all of society. When we feel that God is calling us to intervene with others in these social dynamics, we should realize that this too is part of our spirituality, which is an exercise of charity and, as such, matures and sanctifies us. The Sacraments are a privileged way in which nature is taken up by God to become a means of mediating supernatural life. Through our worship of God, we are invited to embrace the world on a different plane. Water, oil, fire and colours are taken up in all their symbolic power and incorporated in our act of praise. The hand that blesses is an instrument of God’s love and a reflection of the closeness of Jesus Christ, who came to accompany us on the journey of life. On Sunday, our participation in the Eucharist has special importance. Sunday, like the Jewish Sabbath, is meant to be a day which heals our relationships with God, with ourselves, with others and with the world. Sunday is the day of the Resurrection, the “first day” of the new creation, whose first fruits are the Lord’s risen humanity, the pledge of the final transfiguration of all created reality. It also proclaims “man’s eternal rest in God”. In this way, Christian spirituality incorporates the value of relaxation and festivity. We tend to demean contemplative rest as something unproductive and unnecessary, but this is to do away with the very thing which is most important about work: its meaning. We are called to include in our work a dimension of receptivity and gratuity, which is quite different from mere inactivity. Rather, it is another way of working, which forms part of our very essence. It protects human action from becoming empty activism; it also prevents that unfettered greed and sense of isolation which make us seek personal gain to the detriment of all else. 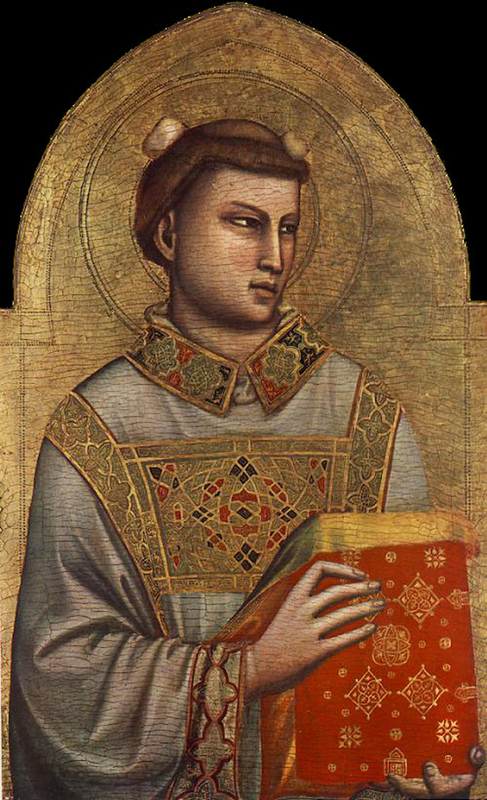 On this second day of Christmas, we remember St. Stephen, deacon and martyr, who in the account of Acts was the first Christian killed because he confessed Jesus Christ to be the Messiah. It’s worth pausing on this day, as most of us recover in some way from the excesses of Christmas Day, to consider the plight of Christians across the world who suffer for their faith. Yesterday in Baghdad, more than 30 Christians were killed by bombs as they worshiped on the Feast of the Nativity. The number of Christians in Iraq has fallen by half (from 900,000) since the beginning of the US invasion in 2003, and now even Christian leaders in Iraq are urging flight. “We are close to those brothers and sisters who, like Saint Stephen, are unjustly accused and subjected to violence of various kinds. This happens especially where religious freedom is still not guaranteed or not fully realised. The internet and Christianity are abuzz with the interview Pope Francis gave with Jesuit publications. What surprised me most was not the soundbytes pulled out by reporters about the hot-button issues but rather the thoroughly Ignatian tone of the entire piece. Pope Francis is not just remaking the Church and the Papacy, he is bringing to the fore the Jesuit mode of proceeding. His talk of discernment, his humility and simplicity, his approach to spirituality and prayer, his demeanor all point to his Jesuit background. But at the same time as he is revolutionizing the Church, he is also revolutionizing the Ignatian tradition. There is no better example of that than in the section of the interview “Thinking with the Church.” James Martin, SJ says that what Pope Francis said here has “immense ramifications” for the Church. As an aside, having taught Ignatius many times over the years, requiring students to read both the Autobiography and The Spiritual Exercises, I always struggled with students’ preconceptions about the Jesuits (“The shock troops of the Counter Reformation) and more broadly Roman Catholics. It was always a challenge to try to get them to understand the flexibility, adaptability, and moderation of the Jesuits, all of which were keys to their success in the 16th and 17th centuries. The “Rules for Thinking with the Church” were in part Ignatius’ attempt to help later Jesuits learn from his experience. When we read, we should think white is black if that’s what the Church says, we assume the worst of the Jesuits and the Roman Catholic Church. A more charitable reading would be that we should submit our own reason and perspective to the long perspective and wider vision of the Church. Pope Francis, by taking “hierarchical” out of the equation, broadens the perspective still further. The back story on how the interview came about is here. There is much for all of us to ponder here. Pope Francis has had an enormous impact on the Roman Catholic Church in the few months of his papacy; he is also challenging all Christians to a more humble, careful, and discerning approach in the world. Today was the Feast of St. Ignatius of Loyola, founder of the Jesuits. To be men routed and grounded in the Church: that is what Jesus desires of us. There cannot be parallel or isolated paths for us. Yes, paths of searching, creative paths, yes, this is important: to go to the peripheries, so many peripheries. This takes creativity, but always in community, in the Church, with this membership that give us the courage to go forward. To serve Christ is to love this concrete Church, and to serve her with generosity and with the spirit of obedience. As I witnessed his day by day abandonment of centuries-old custom, I marveled at his joyful, spiritual freedom. I soon realized it manifested his appropriation of the Ignatian value of “indifference.” It is an old-fashioned, philosophical term, borrowed from the Stoics, but what indifference means is freedom from distracting and degrading attachments, so as to be free to do what is more conducive to the good of souls. As Pope Francis has made his daily changes, it has become clear that his aim is to make the church the church of Christ, welcoming to all, and appealing because it shows its care for all people. One maxim that comes from the Spiritual Exercises, tantum quantum, summarizes the principle for using all created things: Use them insofar as they contribute to the glory of God and the salvation of souls. Discard and reject them, when they lead away from that goal.